From $1M to $100M in annual recurring revenue in less than 21 months, the company is likely to be the fastest growing enterprise software company in history. UiPath deepens its commitment to accelerate real Artificial Intelligence (AI) outcomes through Robotic Process Automation (RPA) for organizations of all sizes. UiPath, the leading Enterprise Robotic Process Automation (RPA) software company, has closed its series C funding raising $225 million at a valuation of $3 billion. The round was co-led by existing investor CapitalG and new investor Sequoia Capital. Accel, which led both UiPath Series A and B rounds also participated in this round. UiPath is likely to be the fastest growing enterprise software company in history. The company announced in early July that it had increased its annual recurring revenue from $1M to $100M – a feat which it believes no other enterprise subscription software business has accomplished in such a short time. UiPath counts more than 1,800 global customers and is adding six new enterprise customers per day; the company expects annual recurring revenue at the end of 2018 to increase by more than four times compared to the end of 2017. The company plans to use the additional funding to support its accelerated product development ambitions, deepen its ecosystem of partnerships to deliver complementary AI-enabled solutions, broaden the role of RPA in enterprise process automation initiatives, and invest in M&A opportunities. 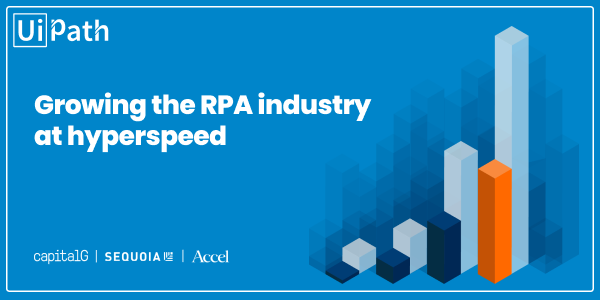 Democratizing RPA remains a top priority with free academy training programs, the Community Edition to enable free RPA access, and Community Forum to connect developers, customers and partners alike to accelerate the adoption of digital-era skills. UiPath expects to end 2018 with more than 1,700 employees, a three-fold increase in 12 months, with operations in 30 offices across 16 countries. With a thriving RPA developer community of more than 250,000 worldwide, UiPath is on a mission to democratize RPA and support a digital business revolution. Based in New York City, UiPath’s presence today extends to 14 countries throughout North America, Europe and Asia. The company is backed by over $400M in funding from Accel, CapitalG, KPCB, Credo Ventures, Earlybird’s Digital East Fund, Sequoia Capital and Seedcamp.